As you're probably aware there is normally a reasonable level of maintenance to be done during the winter, and this year is no exception. A general engine service and brake fluid flush are a given. 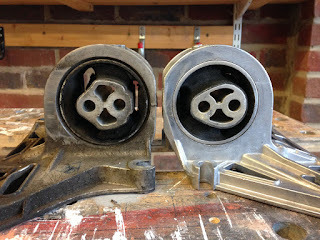 Since we noticed a lot of gear stick movement through high speed corners we going to replace engine and gearbox mounts. As usual it's what you have to remove to gain access that takes the time. A huge breaker bar and socket to undo the hub nuts made easy work before getting the car high up onto jack stands. Removal of the rear bumper, heat shielding, exhaust, rear chassis supports, engine tray and catalytic converters followed. The nuts and bolts on the cats were pretty rusted, even being only 2-3 years old so this is something to do every couple of years regardless. With this lot out of the way it's easier to replace the side engine/gearbox mounts. Whilst the car is up in the air we did change the spark plugs and the gearbox oil (which has probably never been changed) and lubricated the gear change mechanism. Finally the front engine mount was removed and replaced. It feels just a little precarious supporting the engine on a jack and lowering it 2 inches to get access to the final bolts, but the process worked a treat. All in all this was about two full days work for two of us.